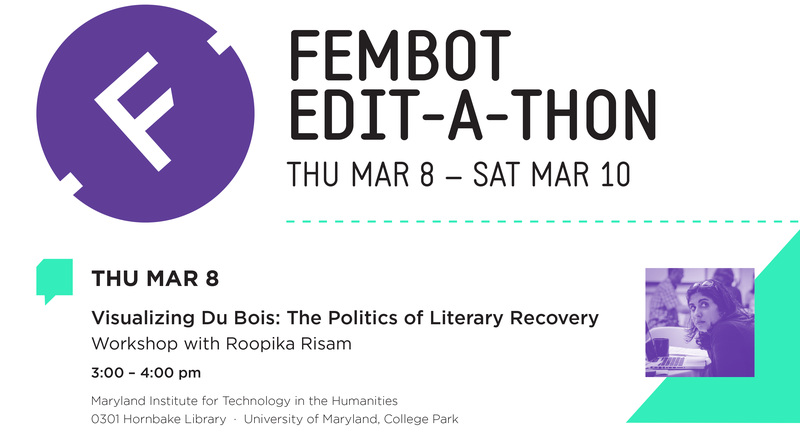 We are excited to have Roopika Risam on campus to kick off a weekend of digital humanities events between March 8 and 10th. Risam’s work focuses on the intersections between postcolonial, African American, and US ethnic studies, and the role of digital humanities in mediating between them. Please join us Thursday, March 8th at 3:00 pm for Risam’s talk, Visualizing Du Bois: The Politics of Literary Recovery. This talk, drawn from her current book project, examines W.E.B. Du Bois’s influence on knowledge infrastructures in the humanities. This event will be held at the Maryland Institute of Technology in the Humanities (MITH), 0301 Hornbake Library North. Roopika Risam is Assistant Professor of English, Coordinator of the Digital Studies Graduate Certificate Program, Digital Humanities Coordinator, and Chair of the Program Area for Content Educators at Salem State University. She is the author of New Digital Worlds: Postcolonial Digital Humanities in Theory, Praxis, and Pedagogy (Northwestern University Press, 2018). Her current book project examines W.E.B. Du Bois’s influence on knowledge infrastructures in the humanities. Follow her on Twitter @roopikarisam. We will meet in Middleton Hall, upstairs in the Humanities building, if you want to know more show up tomorrow night!